It was my first time being recognised out on the street by a reader of my blog, a moment that made me feel a little bit the celebrity for the rest of the day. There I was on a drizzly winter’s day at my local farmers’ market, having a morning snack of an excellent spring onion pancake, when someone came up behind me. It was the lovely Louisa, armed with an offering of dried chickpeas. Her dad’s own grown chickpeas from Wycheproof, in north western Victoria. How could I possibly refuse? Louisa herself runs a stall at the market called Shuki & Louisa, selling Middle Eastern dips and other specialities, made together with her friend and business partner (Shuki, of course). I immediately knew what I would do with these lovely little chickpeas. It’s been in the works for a while, especially after reading Rachel’s post on pasta e ceci, pasta with chickpeas. Like many of the recipes Rachel writes about, I couldn’t get this one out of my head. These cold, Melbourne winter days were asking for some comfort food and Louisa’s chickpeas had arrived just at the right time, and so began the process for that homely, immensely satisfying, southern Italian dish, pasta e ceci. It is a strikingly simple recipe, made from humble ingredients, but nutritious, filling and moreish. 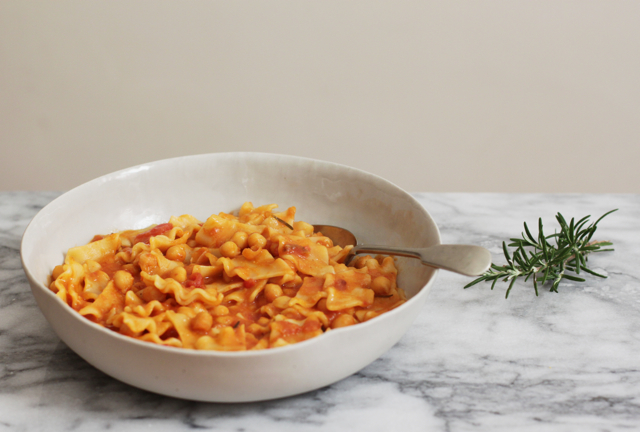 A cousin of pasta e fagioli (pasta with beans), pasta e ceci is equally a staple of many a household on the Italian peninsula from Tuscany and below, although it’s presence is more concentrated the further south you go. Admittedly it’s not a regular dish in our house or my Tuscan in laws, perhaps not as common as a simple passata di ceci (a simple soup of chickpea puree). But head to Rome or Naples and this would be a fixture on many a menu and kitchen table. 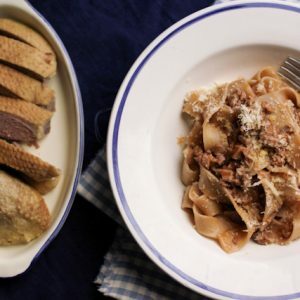 Further south (as far south as you can get on the mainland) in Puglia’s Salento, pasta e ceci morphs into ciceri e tria, where the pasta is handmade and cut into short tagliatelle, a third of it is deep fried and scattered on top of the dish of pasta, served in a sauce of whole chickpeas. It’s unmistakably influenced by Arabic and Sicilian cuisine. As with many of the best, home cooked favourites, there are many different ways to prepare pasta e ceci, tweaked to perfection over generations according to regional or family preferences. There are those who like it without (or with very little) tomato, those who like it stained vermillion with tomato – and of those there’s the option of fresh, concentrate, canned whole or pureed tomato. 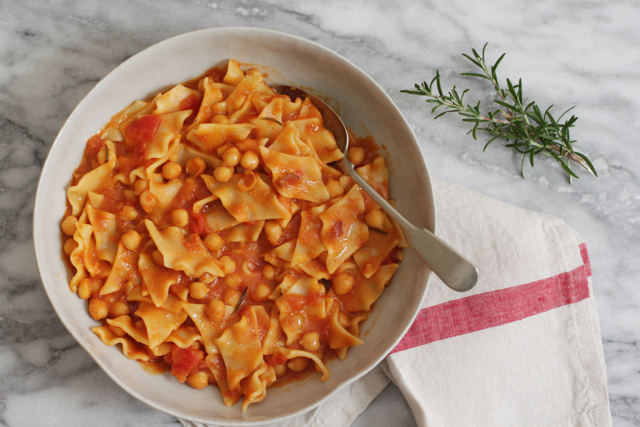 There are those that puree a portion of the chickpeas (whether it’s best a third, half or three-quarters) and those that leave this dish at its most elemental with whole chickpeas – alla romana. Then there’s the argument over whether to cook the pasta with the chickpeas, or separately, adding them once cooked, and finally, whether to use short or long pasta. So rather than a recipe, let’s say this is a suggestion of one way you could prepare this wonderful dish, as all the variations have their merits. This is a version that does not involve a soffritto (chopped carrot, celery and onion) but has just garlic, rosemary and a touch of chilli accompanying the chickpeas. Tomato – and quite a bit of it, probably a bit more than is “normal” – is added in the form of chopped canned tomatoes and about a third of the chickpeas were pureed. For me, when you have this pureed, soupy sauce that calls for eating with a spoon, short pasta is the way to go with pasta e ceci. If you like and you’re not intending on keeping this a vegetarian dish, you could also add some chopped, crisp pancetta or melt some anchovies together with the garlic. My husband cannot resist putting vongole, clams, with chickpeas. Somehow the earthy, silkiness of chickpeas with briny, sea-salty, chewy clams are a match made in heaven. Try it. 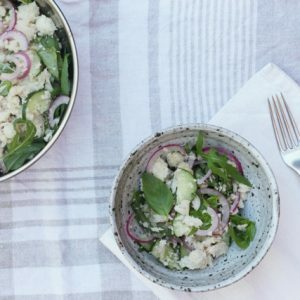 I think it goes without saying that with any dish as simple as this one, the quality of your ingredients goes a long way – I cannot stress how important this is for the chickpeas and olive oil in this dish, especially. Ditalini (short, round tubes) are the classic short pasta for this dish, but you could also use pasta mista – mixed, broken up pieces of pasta – or rombi, a lovely, frilly ribbon pasta, cut short into diamond-shapes, which is what I’ve used in the photos (those who prefer long, wide noodles to tubes or other short pasta will like these). If you’re using dried chickpeas, put them in a bowl covered with plenty of fresh cold water the night before and leave them to soak in the fridge. The next day, drain the soaked chickpeas and place them in a saucepan, cover with fresh water, add a bay leaf and simmer for a couple of hours or until the chickpeas are soft. Add salt to taste at the end. Don’t throw away the cooking liquid – this is gold and you’ll need it for the sauce. In another saucepan, gently heat a smashed garlic clove, a sprig of rosemary (minus the twigs, or remove them before adding the chickpeas) and the chilli in a few glugs of olive oil. When it begins to get fragrant and soften, perhaps even slightly colour, add the tomato and let sizzle for a few minutes, the flavours mingling. Add a ladle of the chickpea liquid (if you’ve used canned, use the liquid in the can) and about two-thirds of the chickpeas – set one-third aside and puree it before adding it to the saucepan to create a creamy, thick sauce. There are those that remove the lump of smashed garlic before adding the chickpea puree – but I love finding this in my pasta bowl. It’s like a little prize, cooked to a sweet, mellow version of itself. I leave it in. Add more of the chickpea liquid (or water or stock if you’ve used canned chickpeas) to the sauce until it is substantially watery, then add the dried pasta and cook until the pasta is al dente and the sauce has reduced. If you choose to use a long pasta, you may want to cook it separately in a pot of water then simply add it to the ready sauce. The sauce should now be creamy, not watery, but not too thick either. Like a creamy soup. Season with salt and freshly ground pepper. Ladle the pasta e ceci into shallow bowls, pour over your very best extra virgin olive oil – a bright, peppery, green olive oil is the thing you need – more freshly ground pepper and then let it sit for a moment or two before serving as it will be piping hot and it needs to cool just a little to be best enjoyed. Plus, this gives the flavours in the dish a moment to mingle. I like this with plenty of grated Parmesan or Pecorino cheese, but there are those that like it without. Serve this pasta dish with a spoon. Uuuuh pasta e ceci, I make it quite a lot in the winter -admittedly, most of the time with canned chickpeas (buuuu, shame on me! ), but once in a while also with the dried little ones from Umbria – yum. I use quite a good deal of chilli and I only do a light onion soffritto – pasta wise, I like annellini, but this one with…ehm…reginette? Love the look of it! Reginette are similar, these are rombi, just cut on a different angle I thought they were pretty too! I do use canned chickpeas often for many things – makes such a quick/easy dinner – but every now and then, cooking them from dried can be quite satisfying and just the thing. I always forget you have winter now, it must be so strange! This dish is perfect for cold weather and on my list for when the winter hits this side of the world. I know what you mean about being recognised by a reader, I’ve had it a few times now and it’s so very strange. Especially when they write to you after and tell you they were too shy to come and say hi!! 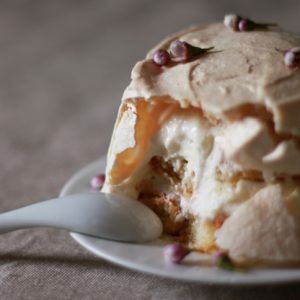 I know, I’m looking at everyone else cooking with peaches and cherries, eating gelato and picnicking outdoors – while I’m rugged up inside and staying warm with comfort food! I bet you get recognised a lot as you’ve got such a unique look and your image is so part of your blog/brand too! I must say I was quite surprised (and impressed) that she was able to recognise me! I’m very fond of chickpeas, as well as simple, comforting pasta dishes, so this is definitely appealing to me. 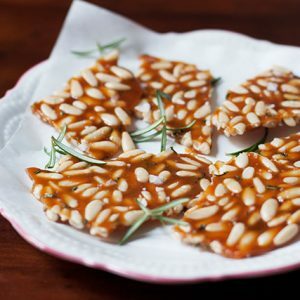 Oh I hope you do try it, though look at Rachel’s recipe (link towards the top of the post) too – hers is probably the best one to start with! What an absolutely wonderful moment! And such a gorgeous gift. 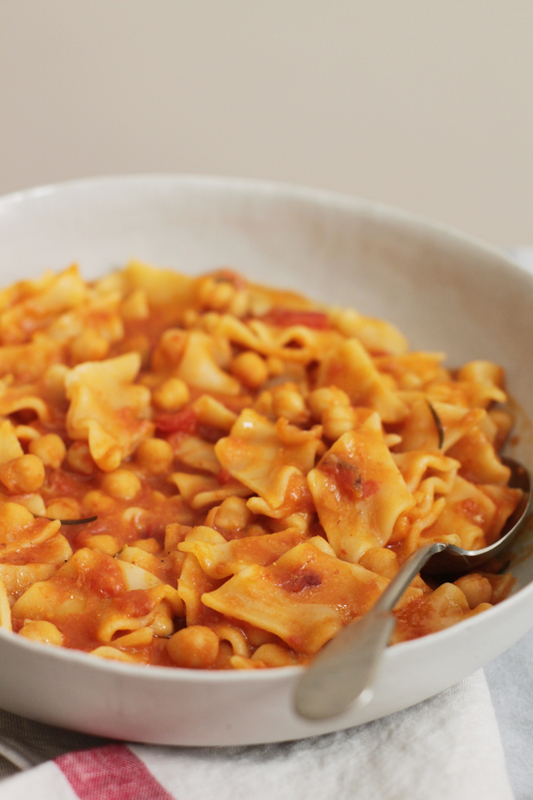 I adore the double carb combination – chickpeas and pasta, pasta and bread etc – and this comforting dish is one that I always love to eat when I come to Italy. Can’t go wrong with the double carb combination! Had pesto with potato and green beans today and thought the same thing then too. Emiko, what sized can do you use half of? Thanks! Hi Wendy – good question, sorry for not specifying, it’s a regular tin of tomatoes which is about 400 gr (14 oz). Adjust as you like (less or more tomatoey). You could also use a tablespoon of tomato paste in place of the tinned tomatoes. I made this with the full tin of tomatoes and it was sooooo delicious!! Such a quick comforting meal.